We are still recovering from a festive last week of the year. but the team at Crowdfund Insider is looking forward to an awesome 2015. The year always starts with a bang as CES consistently delivers many crowdfunded tech products both already funded and those preparing to do raise backing from the crowd. For this week’s Crowdfunding Mailbox we have two practical tech devices and one incredibly simple but useful product. First on the list is Zetally Avy Smart Speaker which just launched its crowdfunding campaign on Kickstarter. Avy’s public debut will take place at CES next week but the new device jumped out of the gate with solid crowd support. Zettaly is a small startup founded by a former Googler and a couple veterans from the consumer electronics industry. The goal of the company is to create and deliver really cool hardware that’s affordable. Zetally has gone the crowdfunding route previously and successfully funded PowerX(formerly ThinkPower) back in September. Rewards for PowerX were delivered on time and backers were pretty pleased – a promising sign for backers of Avy. So why is Avy so cool? It is a high quality, smart speaker powered by Android. The device incorporates a 7″ touchscreen, WiFi & BlueTooth connectivity plus some decent 10 watt speakers. This multifaceted product can handle a ton of different tasks, from smart alarm clock to playing movies; all for the very low price of $99. You can’t beat that. Avy incorporates a rechargeable battery that claims the ability to play music for up to 7 hours. If you are an Android fan – this one is for you. cross country flight. Skÿn is only available for iPhone today but Android versions are on the list – and the project creators expect to be able to deliver an Android version once they hit certain milestones. The campaign is already fully funded on Indiegogo with well over a month to go. The next crowdfunding campaign is an adhesive gel pad called KaVii. This is similar to a hugely successful product that raised funding earlier this year called PuGoo, but KaVii is transparent and claims to use a different gel mix. KaVii. This product effectively allows you to stick your smartphone or tablet on just about any surface. I can see Kavii being incredibly useful. The pad sticks to the back of your device and secures it to a wide array of surfaces such as metal, glass or plastic. I have a suction device for my iPhone inmy car and it is really horrible. Constantly loses suction and drops to the floor of the car. I would have been better off with a 4 pack of KaVii. Creators state that once the pad gets soiled you simply wash it and it regains all adhesive power. No glue residue is left once you peel it off. For a $9 dollar you can’t go wrong. Crowdfunding on Kickstarter now and overfunded. Avy is an Internet-connected speaker that lets you enjoy music, shows, movies all in the same sleek, portable package. Featuring professionally fine-tuned sound, powerful 10-watt speakers, crisp 7” touchscreen, Wi-Fi and Bluetooth connectivity, Avy is a perfect entertainment companion on your desk, in the kitchen, around the house, or anywhere you go. 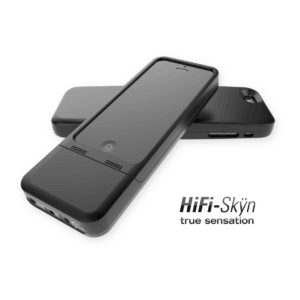 The CEntrance HiFi-Skÿn is a sound system that fits right inside the phone case. It delivers your music in pristine audio fidelity and on top of that, packs a long-lasting battery to charge your phone while playing! Besides audiophile sound quality it features a powerful amp that works with most sophisticated headphones on the market. HiFi-Skÿn is perfect for those extended shifts at work, on long flights, or at home, when you need some quality tunes but the phone’s buzzy sound just wouldn’t cut it. No more compromises. Leave your music player at home. Now you can carry one device that’s perfect for both music and communication—your existing phone in a HiFi-Skÿn. The idea for KaVii Adhesive started early in 2014 when we were in search for a car mount for our cell phones. Unfortunately, all models we found were too big, bulky, and difficult to store in the car. Similarly, at home we love watching movies and videos on our tablets (iPad and Galaxy tab), but we found it really difficult to get comfortable while holding it, even when using the portable stand/case that allows you to prop up the device. We tried to use something simple like big sticky, floppy, gel pads for the dashboard. But those tend to melt over time, leaving our dashboard looking messy and damaged. The pads themselves weren’t very sticky to begin with either.